Price: £2.20 (incl VAT) Sorry, this item is currently unavailable. Click here to receive notification when this product comes back into stock. 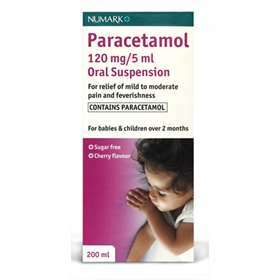 Numark Paracetamol Suspension 3+ Months Cherry Flavour - For Children Over 3 Months. Oral suspension for babies and children. For relief of mild to moderate pain and feverishness associated with teething, toothache, headache, colds, flu and post-immunisation fever. 3 months - 6 months 2.5 ml spoonful. 6 - 24 months 5 ml spoonful. 2 year - 4 years: 7.5 ml spoonfuls. 4 - 6 years: 10 ml spoonfuls. Doses can be repeated every 4-6 hours as required, up to a maximum of 4 doses in 24hrs. Ingredients: Paracetamol, Saccharin Sodium, Sodium Benzoate, Hydrogenated Glucose Syrup, Glycerol, Ethanol, Polysorbate, Sorbitan Monooleate, Amaranth, Magnesium Aluminium Silicate, Xanthan Gum, Cherry Flavour, Citric Acid Monohydrate And Purified Water. Product code: 1063122 Price: £2.20 (incl VAT) Sorry, this item is currently unavailable. Click here to receive notification when this product comes back into stock.